^^These six classic lectures by distinguished scholar Abraham Kuyper (1837?1920) on the key figure in Reformation theology were delivered at Princeton Theological Seminary in 1898. Kuyper introduces Calvinism as a life-system, discussing its relationship to religion, politics, science, and art. According to Kuyper, Calvinism seeks to unify the cosmos under universal laws. For instance, he states that predestination proves that a set of laws exists to govern the world, and science is merely trying to figure them out. Kuyper defends Calvinism in the realm of art as well, providing a thorough and elegant explanation of this outlook on life. 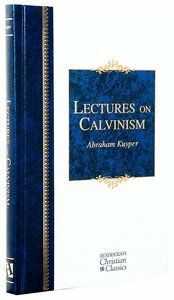 The collection is called Lectures on Calvinism and not lectures on Christianity because Kuyper believed that Calvinism most truthfully and most completely articulates the Biblical Christian faith. - Publisher "Over one hundred years ago, Dutch theologian, politician, and educator Abraham Kuyper delivered six remarkable addresses at Princeton University on the importance of Reformed theology in every part of our lives." "With passion borne from years of education and spiritual commitment, Kuyper asserted that Calvinism is a system of life that influences each aspect of human experience. Reformed theology provides a framework that leads us to obedience with God in politics, art, science, religion, and the future. It is a way of discovering how we are to relate to God, engage with others, and live well in the larger world." "Kuyper's words do more than provide historical insight into a theology that would change the lives of many. More than a century after they were first delivered, these lectures offer direction to a world looking for meaning." --BOOK JACKET. About "Lectures in Calvinism (Hendrickson Christian Classics Series)"
"Over one hundred years ago, Dutch theologian, politician, and educator Abraham Kuyper delivered six remarkable addresses at Princeton University on the importance of Reformed theology in every part of our lives." "With passion borne from years of education and spiritual commitment, Kuyper asserted that Calvinism is a system of life that influences each aspect of human experience. Reformed theology provides a framework that leads us to obedience with God in politics, art, science, religion, and the future. It is a way of discovering how we are to relate to God, engage with others, and live well in the larger world." "Kuyper's words do more than provide historical insight into a theology that would change the lives of many. More than a century after they were first delivered, these lectures offer direction to a world looking for meaning." --BOOK JACKET. Dr. Abraham Kuyper (1837-1920) was a Dutch Calvinist theologian, philosopher, and politician. As leader of the Anti-Revolutionary Party in the Netherlands, he served as Prime Minister of his country from 1901-1905. He occupied himself with the task of reconstructing the social structures of his native land on the basis of its Calvinistic heritage in almost every area of life. He developed Neo-Calvinism, which emphasizes the sovereignty of Jesus over all mental pursuits and supports the idea that there is a grace given by God to all things in order to sustain the continued unfolding of creation. Kuyper wrote a number of books, including Conservatism and Orthodoxy (1870), The Social Question and the Christian Religion (1891), and Common Grace (1902). In an age of moral laxity and spiritual decline, John Wesley (1703-1791) took the gospel to the masses and transformed the English nation. This book represents the essential core of Wesley's enormously influential teachings on sanctification and holiness. 144 pages, from Hendrickson. Methodist minister and Civil War chaplain Edward McKendree Bounds (1835-1913) considered conversation with God as fundamentally vital to the Christian's life as physical breath. He devoted the last 17 years of his life to intense intercession and to penning some of the most perennially popular works about prayer. This attractive volume features the very best of his beloved writings.